Decorate your bathroom like only a princess of Arendelle can with these fun Frozen bath accessories! Frozen themed bathroom decorations are a perfect way to personalize your child's bathroom and make bath time activities as fun as watching the movie Frozen! 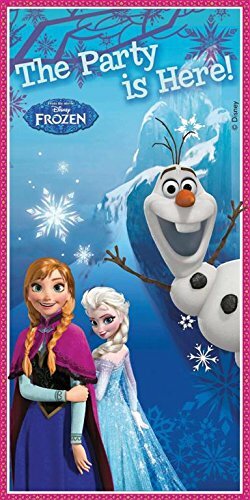 This colorful image will really make your Frozen-themed bathroom stand out! Portraits of the movie's two heroines are set on a blue background. Pick from different sizes and images. Shower curtain hooks featuring your favorite characters from Disney's Frozen! The 12 hooks feature Olaf, Anna, and Elsa and go perfectly with your Frozen shower curtain! Complete your Frozen bath with this mat! White snowflakes on a teal background feature on this slip-resistant tub mat for your Frozen bathtub! Portraits of Anna and Elsa complete the design. This set of two teal Frozen towels is perfect for your Frozen-themed bathroom! Images of Anna and Else are set inside embroidered snowflakes. Images of Anna and Elsa feature on these wash rags. The six cloths are 100% cotton and measure 12 inches square. Olaf is all smiles on this darling bath rug. The round rug has cotton backing and is a teal color with pink trim. This reusable 16oz cup is perfect for your Frozen-themed bathroom. Keep it on the sink for late night glasses of water. This small tin wastebasket has a beautiful image from the movie Frozen featuring Olaf and Anna. This trash bin is perfect for the Frozen fan's bathroom! This little Olaf figure is cute and functional! Use the Olaf bottle to store hand lotion or liquid soap. Pick up this pack of six Frozen facial tissue boxes to keep your Frozen-themed bathroom well-stocked! Each box of 2-ply tissues has a different look. Beautifully decorated tubes hold Frosted Berry-scented bath necessities including conditioning shampoo, body lotion, and body wash.